Malignant mesothelioma is a disease in which malignant (cancer) cells are found in the pleura (the thin layer of tissue that lines the chest cavity and covers the lungs) or the peritoneum (the thin layer of tissue that lines the abdomen and covers most of the organs in the abdomen). 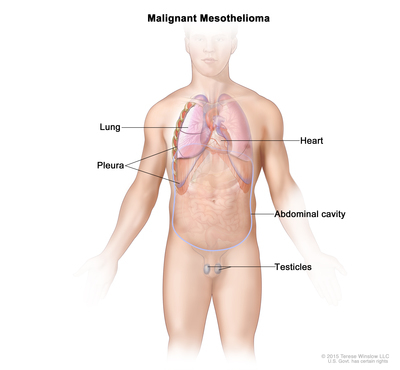 Malignant mesothelioma may also form in the heart or testicles, but this is rare. Being exposed to asbestos can affect the risk of malignant mesothelioma. Anything that increases your chance of getting a disease is called a risk factor. Having a risk factor does not mean that you will get cancer; not having risk factors doesn’t mean that you will not get cancer. Talk to your doctor if you think you may be at risk. Most people with malignant mesothelioma have worked or lived in places where they inhaled or swallowed asbestos. After being exposed to asbestos, it usually takes a long time for malignant mesothelioma to form. Living with a person who works near asbestos is also a risk factor for malignant mesothelioma. Signs and symptoms of malignant mesothelioma include shortness of breath and pain under the rib cage. Problems with blood clots (clots form when they shouldn’t). Tests that examine the inside of the chest and abdomen are used to detect (find) and diagnose malignant mesothelioma. Sometimes it is hard to tell the difference between malignant mesothelioma in the chest and lung cancer. Physical exam and history: An exam of the body to check general signs of health, including checking for signs of disease, such as lumps or anything else that seems unusual. A history of the patient’s health habits, exposure to asbestos, and past illnesses and treatments will also be taken. CT scan (CAT scan): A procedure that makes a series of detailed pictures of the chest and abdomen, taken from different angles. The pictures are made by a computer linked to an x-ray machine. A dye may be injected into a vein or swallowed to help the organs or tissues show up more clearly. This procedure is also called computed tomography, computerized tomography, or computerized axial tomography. Biopsy: The removal of cells or tissues from the pleura or peritoneum so they can be viewed under a microscope by a pathologist to check for signs of cancer. 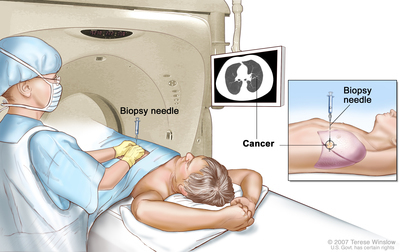 Fine-needle (FNA) aspiration biopsy of the lung: The removal of tissue or fluid using a thin needle. 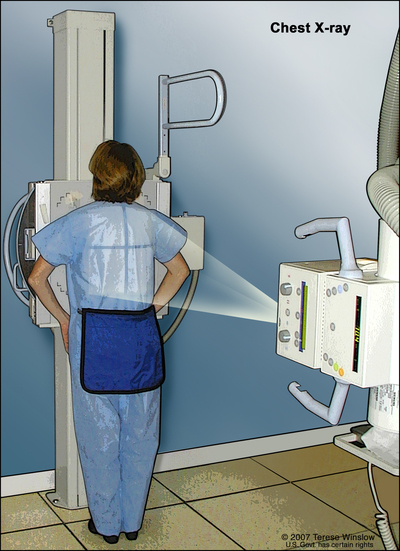 An imaging procedure is used to locate the abnormal tissue or fluid in the lung. A small incision may be made in the skin where the biopsy needle is inserted into the abnormal tissue or fluid, and a sample is removed. Thoracoscopy: An incision (cut) is made between two ribs and a thoracoscope (a thin, tube-like instrument with a light and a lens for viewing) is inserted into the chest. Peritoneoscopy: An incision (cut) is made in the abdominal wall and a peritoneoscope (a thin, tube-like instrument with a light and a lens for viewing) is inserted into the abdomen. Open biopsy: A procedure in which an incision (cut) is made through the skin to expose and remove tissues to check for signs of disease. Cytologic exam: An exam of cells under a microscope to check for anything abnormal. For mesothelioma, fluid is taken from the chest or from the abdomen. A pathologist checks the fluid for signs of cancer. Electron microscopy: A laboratory test in which cells in a sample of tissue are viewed under a high-powered microscope to look for certain changes in the cells. An electron microscope shows tiny details better than other types of microscopes. The amount of fluid in the chest or abdomen. The patient's general health, including lung and heart health. The type of mesothelioma cells and how they look under a microscope. The number of white blood cells and how much hemoglobin is in the blood.